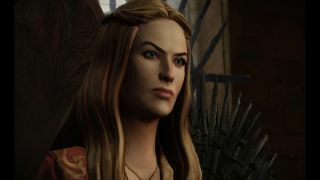 Telltale Games has released the first teaser for Game of Thrones, confirming that the screens that leaked earlier this week are legit—and that several well-known characters from the television series will appear in the game. Game of Thrones will play out from the perspectives of five different members of House Forrester, which finds itself in a "precarious position" as the War of the Five Kings unfolds around it. Telltale said players must be "mindful" of how the actions of one member of the House affects the rest as they seek to save it from destruction. "The actions of one character can ripple out to affect the rest of House Forrester," Telltale said. "Multiply the actions of one character by five, and you're truly playing the Game of Thrones... where you win, or you die." Events in the game will begin near the end of the third season of the HBO series, and conclude immediately prior to the start of season five. Several actors from the show will reprise their characters for the game, including Peter Dinklage as Tyrion Lannister, Lena Heady as Cersei Lannister, Natalie Dormer as Margaery Tyrell, and Iwan Rheon as Ramsay Snow. Additional characters from the series will appear in later episodes. One thing Telltale didn't reveal is when Iron From Ice, the first of six chapters in its Game of Thrones series, will be out, saying only what it's already said: soon. Update: 13 websites also had exclusive character reveals today. Here they are, but on one website, with links to 13 other websites.